You don't have to count calories to pack on size. Simply follow these 15 key steps to more muscle growth. Nearly every bodybuilding mass-gain nutrition plan I've seen has one serious drawback: They require you to weigh and measure every single thing you eat, and then write it down or enter it into a calculator. Some apps make it easier, but weighing that turkey burger, then entering it—and the tomato, mayo, bun, and lettuce—is time-consuming and tedious. Even food labels can be inaccurate and misleading. The food-labeling guide, from the FDA allows nutrition-fact labels to be off by as much as 10-20%, giving way to even more tracking inconsistencies and headaches. 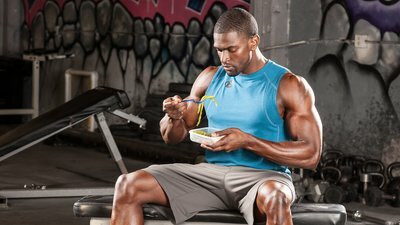 Arithmophobia aside, a lot of very successful competitive bodybuilders make just such calculations daily to completely control the calories they're eating. And while that may be necessary for the guy about to step onstage after 12 weeks of dieting, it may seem like too much effort for the recreational lifter. Fortunately, you don't have to weigh out every single thing you eat in order to gain mass. Let's take a look at an alternate way that simplifies the process a whole lot and still maintains your goal of adding monster size. By following these simple tips, you can attain your goal of monster size without ever busting out a calculator! The first six steps will help ensure your diet consists of clean, high-quality foods, and the last 10 will help you add the quality calories you need to gain muscle with a minimum of excess fat. Most of us follow fairly well-established routines when it comes to how, when, and even what we eat. The idea here is to take note of those foods, fine tune them a bit with the first six steps below, and watch the scale to see where it's heading. Unless you're significantly overeating or undereating, the scale probably doesn't move much to the north or south, which is why you're here. You need to fill your diet with the right foods before you begin adding a caloric surplus. You may choose a particular food based on how it tastes, but once it's down the hatch, all that matters is its macronutrient profile and the micronutrient content. Remember that food is fuel. It is essential to survival and vital to maximizing your performance and recovery. Eating clean, healthy foods will go further in building your physique than if you rely on processed meals, fast food, and other landmines that dot the typical American diet, which have contributed to building a different kind of physique. Eating clean, healthy foods will go further in building your physique than if you rely on processed meals, fast food, and other landmines that dot the typical american diet. Consuming a variety of unprocessed whole foods is a good start to building your nutrition plan. Additionally, making a conscious effort to reduce processed and fast foods as much as possible will go a long way. Be sure to pay attention to portion sizes, cooking methods, and sauce and dressing additions when eating out. These flavor enhancers should be reduced; however, inclusion of zero-calorie or low-calorie seasonings, dressings, and marinades can be great tools to have in your belt. Protein is arguably the most important macro for muscle building. That's because protein foods are broken down into individual amino acids, which are then reassembled in your body. The aminos that enter muscle cells can help repair muscle tissue damaged from a hard workout, enabling it to grow larger and stronger. How much protein do you need daily? The simplest method is to use your body weight in pounds. If you weigh 210 pounds, try to consume around 210 grams of protein per day. Your main whole-food sources of protein should be animal-based, including beef, chicken and turkey, eggs, dairy, and fish. Choose leaner cuts of beef (opt for "loin" and "round" cuts of steak, which have the lowest amounts of saturated fat) and remove the skin from turkey and chicken. Fattier cuts of beef like prime rib and rib-eye, as well as higher-fat dairy products, can really boost your daily calories and your fat intake. About half of your total daily calories come from carbohydrates, which fuel your energy needs throughout the day, including your workouts. All carbs (except fiber) are broken down into sugar molecules, but the longer-chain complex and starchy carbs enter the bloodstream more slowly. Complex carbs such as brown rice, whole-grain breads, bagels, tortillas, yams, sweet potatoes, and quinoa provide more sustained energy throughout the day. Simple sugars, such as those found in high-sugar cereal, candy, chips, and baked goods are rapidly absorbed and can spike blood sugar. A spike in blood sugar leads to a rapid release of insulin and subsequent crash in energy levels shortly after ingestion. Complex carbs are associated with a steady rise in blood sugar levels, which leads to a slower insulin release and sustained energy levels. Complex carbs such as brown rice, whole-grain breads, bagels, tortillas, yams, sweet potatoes, and quinoa provide more sustained energy throughout the day. Consistent release of insulin can lead to storage of glucose into fat tissue, which is not the type of monster mass we're trying to put on! Opting for complex carbs with minimal processing is good for your health, as well as for keeping body fat in check. Restrict simple carbs, including fruit juice, to no more than about a fifth of your daily carb totals, which includes any post-workout beverage you may consume. Ideally, restrict these high-sugar options to immediately pre- and post-workout, to maximize performance and recovery rather than fat storage. Once considered a villain in the American diet, fat is now known to play an important role in boosting exercise performance, recovery, and energy production. Fat also plays a major role in the synthesis of muscle-building hormones. It became a bad guy for many Americans because so many people overeat, and especially overeat fat. But for most healthy young men who train daily, consuming 30 percent or so of your daily calories from fat is the way to go. If you consume protein from animal sources, you're probably consuming enough saturated fat along with that protein. The other half of your fat intake should come from monounsaturated or polyunsaturated sources, including olive and canola oils, nuts and seeds, and fatty fish. This is important for several reasons. First of all, consuming moderate amounts of protein throughout the day promotes protein synthesis better than eating the same amount of food with the three-meals-a-day approach. Since protein synthesis drives muscle growth, that's an important distinction. To support mass building, consume at least 5-6 meals a day. Additionally, if you're active and train hard, you likely expend a lot of calories each day. It's very difficult, in fact, to eat three meals' worth of clean foods that can replace all the energy you expend, not to mention the calories you want to consume above and beyond for muscle growth. To support mass building, consume at least 5-6 meals a day. For most individuals that'll still include breakfast, lunch, and dinner, but now you'll add between-meals snacks, pre- and post-workout nutrition, and even before-bedtime snacks as caloric-intake boosters. Focus on fueling your body every 3-4 hours for optimal performance and recovery. Frequent eating also better controls hunger, making you less likely to impulsively reach for the wrong kinds of foods. Divide your total daily protein intake (about a gram per pound of body weight) by the number of meals you eat. For instance, if you weigh 210 pounds and eat six meals per day, you should consume around 35 grams of protein at each meal. Knowing your per-meal protein goal is just the first part. The other half is knowing what a serving of protein looks like. Is it 2 oz. of chicken breast—or 4, 6, or 8? Learning how to eyeball the right portion sizes will help you in the kitchen, and knowing the numbers will aid you when ordering in restaurants as well. Knowing your per-meal protein goal is just the first part. The other half is knowing what a serving of protein looks like. Once you're following a clean, high-protein, balanced diet that's not filled with junk or a lot of fast food, you're ready for the next 10 steps. The goal is to start adding more quality calories, to help you add more muscle without excess body fat (though some fat gain is to be expected). Your aim is to add about 2-3 pounds a month. Sure, there are ways to add weight faster, but the focus here is on quality gains. To increase your body weight—and assuming you're already training smart and hard in the gym—the next step is to increase your caloric intake. One of the simplest ways to do that is to consume about 500 calories more per day more than you normally eat. By ensuring you have a caloric surplus, you provide your muscles with the raw materials to repair tissue damage brought on by heavy training. To increase your body weight the next step is to increase your caloric intake. Consider two snacks of about 250 calories and 30 grams of protein apiece that you can insert anywhere during your day. The idea here is that they won't be filling enough to adversely affect your food consumption at other parts of the day. When aiming to increase the number of calories you eat each day, it's smart to reduce the number of foods that will fill you up without much of a caloric punch, like popcorn and veggies. Without a doubt, some high-volume foods like soups and salads can add a number of important micronutrients to your diet, but don't fill up on them. You won't be as hungry for the calorically dense ones that pack a weightier caloric punch. That's not to say you want to be adding oils and sauces to all your foods, or downing the supersized bag of french fries. Opting for healthier fats and methods of preparation are still smart ways to monitor your overall fat intake. Eating multiple whole-food meals each day requires a lot of planning and preparation, which is one reason the shaker cup is every bodybuilder's best friend. Just fill your cup with a scoop or two of protein powder and your choice of beverage, and you've got an instant snack. Besides keeping amino acids in constant supply in your bloodstream, these liquid meals are absorbed quickly and shouldn't adversely affect your appetite for bigger whole-food meals later in the day. The evidence of a post-workout "anabolic window" is less convincing today, but if you're looking to gain muscle mass, use every opportunity to increase your caloric consumption. After a hard training session, not only are muscle glycogen and blood-sugar levels commonly low, but the catabolic hormone cortisol is on the rise. A fast-digesting protein-and-carb shake is an easy way to speed nutrient delivery to your muscles after your training session and put you back in an anabolic state. A fast-digesting protein-and-carb shake is an easy way to speed nutrient delivery to your muscles after your training session and put you back in an anabolic state. Late-night munchies can ruin a day's effort of clean eating, so if you're looking for a midnight meal, choose a protein-rich option. Protein ingested immediately prior to sleep is effectively digested and absorbed. To help keep a long-term supply of amino acids running through your blood stream and delivered to your muscles, opt for slow-digesting choices such as casein protein or your favorite low-fat dairy product, which contains around 80 percent casein and 20 percent whey protein (cottage cheese, Greek yogurt, cow's milk). The addition of healthy fats such as nut butters, nuts, and seeds will also help to slow down digestion for a constant supply of amino acids. For many people, late night is not the time to opt for carb-rich foods, which can elevate insulin levels, meaning you're more likely to store those extra calories as body fat. I'll bet you almost never miss a workout, because you'll never let anything come between you and your training. But when life gets hectic, it's far easier to skip a meal. Adopt the mindset that missing a meal is as bad as missing a workout; missing just one meal a day is going to significantly ding your plans to consume 500 calories per day above your equilibrium. Make every meal a priority, and do whatever you have to to keep from missing one. Pack meals ahead of time. Strategically place protein shakes and bars in your car, in your gym bag, and at your office desk. When schedules get tight, at least you'll have a protein-rich option to fall back on. Stock your fridge and cupboards with clean, high-protein foods so that you can make a quick, healthy meal. While you're at it, toss out the junk foods so you won't be tempted to stray from your diet. Stock your fridge and cupboards with clean, high-protein foods so that you can make a quick, healthy meal. That might mean you spend part of your weekend planning and preparing meals, and carrying a cooler or snacks around with you. Spend one afternoon each weekend cooking meals that can be stored in Tupperware containers, and bring them to work and class. This investment in time will help keep you on track all week long. Once you get a system down that works for you, multiple meals for each day of the week can be prepared in as little as 60 minutes! If your goal is to pack on mass, you can't be half-committed, showing up at work or school with nothing to eat. We all have demanding schedules and important obligations; you'll be far more likely to reach your goals with planning and commitment, rather than just winging it. Though a mass-gain eating plan isn't typically confused with "dieting," it's still very clean and allows little room for junk and fast foods. Successful dieters allow room for cheat meals or cheat days that allow them to indulge in foods they wouldn't normally eat. Most importantly, they're right back to their healthy eating plan the very next day, rather than allowing one cheat day to snowball into more. To make the most of the further increase in calories, plan your higher intake on a training day, specifically adding more calories to your post-workout meal. It's nearly impossible to eat clean all the time, so allow yourself a cheat meal at regular intervals—say, on a weekend afternoon—which can make sticking to a diet easier, and the bump in calories may even boost growth. Use cheat meals as rewards for a good week of clean eating. And use moderation—don't pig out! Whey is a fast-digesting protein that helps improve your muscles' ability to recover and adapt after strenuous exercise. It stimulates muscle protein synthesis to a greater degree than other proteins. Creatine monohydrate has a muscle-building and power-enhancing effect by increasing the availability of creatine and phosphocreatine (PCr) within the muscle fibers. This helps to maintain energy during high-intensity exercise such as weightlifting. Long term, it's been shown to lead to gains of 5-15 percent in strength and performance. Caffeine is often thought of as a fat burner, but as an ergogenic aid for strength it's been shown to decrease rates of fatigue and lower perception of effort, which may be helpful during high-intensity training. It also increases alertness and focus, so you're less inclined to skip a workout. Branched-chain amino acids (BCAAs), especially leucine, help to regulate protein metabolism by promoting protein synthesis and suppressing protein degradation, which may improve recovery of muscles damaged during resistance training. Citrulline malate helps to increase rates of ATP during exercise, which means you can do more work, and helps to reduce post-exercise muscle soreness. Nitric-oxide Boosters increase skeletal muscle blood flow, which leads to improved strength and performance and reduced soreness. After several weeks, you should see some initial movement, both on the scale and with the weights you're using. Progress may be slight; though some individuals can make faster progress, for most men, adding about two pounds of solid muscle a month is more the norm. While this may not seem like much, that's 24 pounds over the course of a year, a very healthy gain! When you consider that most of the physiques you admire have taken years to build—not months—you'll understand that this is a long-term process that requires diligence, patience, and discipline. If you're still not making gains, add another small meal, or go back to this list and determine whether you're coming up short in any of the areas mentioned. Make further adjustments and fine-tune your diet as you learn more about your body and the nutrition that fuels it. Since your body is unlike others, consider this a trial-and-error process on yourself. It may take you some time to experiment with various factors to determine what works optimally for you. In that sense, the challenge of building monster mass takes place not just in the gym, but in the kitchen, too. Chandler, R. M., Byrne, H. K., Patterson, J. G., & Ivy, J. L. (1994). Dietary supplements affect the anabolic hormones after weight-training exercise. Journal of Applied Physiology, 76(2), 839-845.